Today is the feast of Saint Dominic. 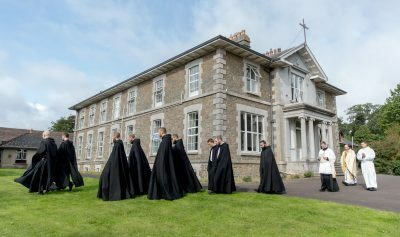 We are delighted to have sons of Saint Dominic (English and Irish Provinces) among us for the feast. I was mindful of the many Dominican friends who are part of my life, and kept them all in prayer. Saint Dominic would spend whole nights weeping and groaning in prayer before the altar. Over and over again he would say, “What will become of sinners? What will become of sinners?” Saint Dominic’s great passion was to reconcile sinners by preaching the mercy of God. If Saint Dominic preached the rosary and prayed it, it was because he knew it to be a prayer capable of winning every grace. The rosary is a prayer of repetition. It is a prayer of confidence. It helps one to persevere in supplication, bead by bead, and decade by decade. Our Lord finds the rosary irresistible because His own Mother “subsidizes” it. She stands behind it. The rosary is the voice of the poor, the needy, the downtrodden, and the weak. Persevere in praying the rosary and one day you will hear Our Lord say to you what He said to the woman of the Gospel: “Great is thy faith! Be it done for thee as thou wilt” (Mt 15:28). 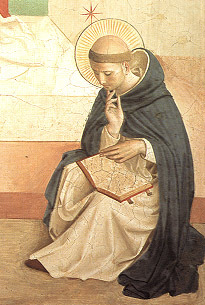 Saint Dominic shows us that, with the rosary in hand, we will experience the triumph of grace.